The phrase “dark circles and puffiness” and I are quite familiar with each other. As a creepy night owl, I’m rarely in bed before 11:30 p.m. and sometimes forget to chug water before drifting off into dreamland. Because of this, another thing I’m quite familiar with in the morning is caffeine — but not just the IV I give myself to function cup of joe I have once I settle in at work. I’m talkin’ 100% Pure Organic Coffee Bea Caffeine Eye Cream. I somehow require more than that, but because I don’t actually drink my coffee until I’ve made it to the office, getting a whiff of 100% Pure’s Organic Coffee Bean Caffeine Eye Cream puts me in a happier mood as I’m getting ready for the day. It takes half a pump of 100% Pure’s Organic Coffee Bean Caffeine Eye Cream to cover the skin around both of my eyes (trust me, you will waste a full pump — it’s a generous helping!). The formula is a medium thickness and feels creamy yet extremely lightweight as it soaks into your skin. You can feel the “wetness” of the formula as you massage it in — thinking this is thanks to the organic aloe juice and organic rose hydrosol that top off the ingredients list. I get a strong scent of coffee with this eye cream, but it does have a delicate undertone of rose and vanilla if you sniff enough. The scent isn’t so overly powerful that it lingers, though; it fades a bit as you massage it in, and it didn’t bother my nose at all during the application process. While this eye cream doesn’t deliver the same tightening and brightening effect as one of my other favorite eye creams, I love 100% Pure Organic Coffee Bean Caffeine Eye Cream for the scent and subtle de-puffing benefits. The additions of vitamin E and C make me happy, too, as those ingredients amp up the moisture value of this eye cream. Also, can I just say that the pricepoint — $21 — is beyond reasonable for the amount of product you get? That’s likely enough for me to say it’s a repurchase, even though I stand by my aforementioned other favorite as a definite staple. At this age, you can never have too many precautionary eye creams and eye serums! 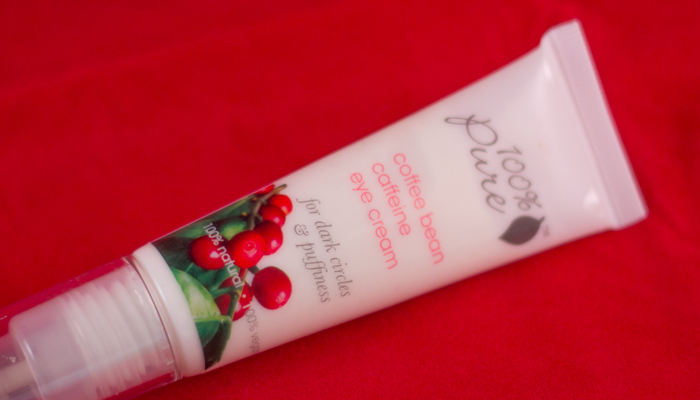 Have you tried 100% Pure Organic Coffee Bean Caffeine Eye Cream? What’s your favorite eye cream or eye serum for depuffing and zapping dark circles? Tell me in the comments section!